Sydney Opera House from Harbour Bridge, originally uploaded by chrisfreeland2002. I haven't been cooking much since September because I haven't been at home much! I've been travelling for my job since the last week of September and will continue at this pace through Thanksgiving. 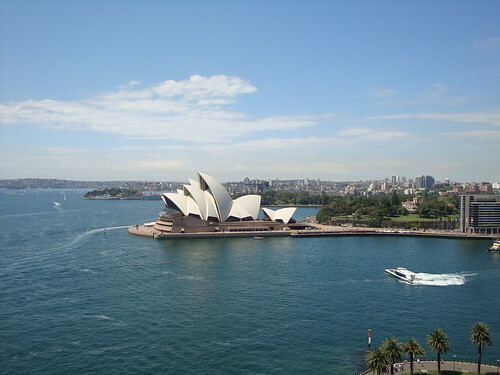 Right now I'm in Sydney with my partner on a week's holiday before heading on to Perth/Fremantle for a conference. Then in November I'll be in Buenos Aires, with 2 stops in Woods Hole, Mass., in between. A hectic schedule, for sure, but exciting! Inspiring, too. One of the aspects I like most about travelling (both domestic & foreign) is the opportunity to sample new tastes & techniques for incorporation into my own cooking. This trip to Sydney has given me several new ideas, what with Australia's beguiling and delicious mix of Asian, Indian & European cuisines. So, I thought I'd take a few seconds to jot down some of my favorite dishes now, then try to work out the recipes once I'm back home after Thanksgiving. Lamb skewers with a chili/lemongrass/tamarind dipping sauce at Pink Peppercorn in Darlinghurst. This is a fantastic restaurant featuring 'modern Laotian' cuisine...so good we went twice! This starter was amazing - savory, sweet and smoky all at once! Roast beef & pumpkin sandwich with caramelized onions on Turkish bread at CQ Cafe on Alfred Street near the Circular Quay stop (hence the 'CQ'). It's spring here in Sydney, yet pumpkin is showing up all over menus. I was intrigued by the thought of roasted pumpkin on a sandwich, delighted by the taste. Tomato, onion, and gruyère quiche at the Wayzgoose Cafe in Leura. We took a day trip to the Blue Mountains (one word: spectacular!) and stopped at this cafe for a late lunch after a looooong day of hiking trails. There really wasn't anything unusual about this dish per se, just a sublimely seasoned & executed dish that hit the spot. Quiches are popular lunches at most cafes and restaurants we visited, and this one was the best I had. Light, airy, perfect. update: Zucchini, gorgonzola, and sun-dried tomato pizza at Little Creatures in Fremantle. I know those three flavors wouldn't normally jump to mind when thinking of pizza, but the long, papery thin slices of zucchini were absolutely delicious on this rustic, sauceless pizza. Just a brushing of olive oil on the dough with the veg & cheese...yummy! Little Creatures is a really cool brewery; they make a fantastic Pale Ale - finally, an Aussie beer darker than a lager!! update: Bacon & Pumpkin Quiche (pic) at The Merchant Coffee Co. Again with the quiche, again with the pumpkin. But this time with bacon!! And panache. LOVED it! update: Lemon Lime Brulee Tart at Dome Coffees (pic). I know this is a franchise, so maybe not so intriguing, but I really liked the idea of caramelized sugar on a tart. Very light, very tasty. update: Lemon Lime & Bitters. OK, so this is a commercial drink made by Angostura, but it was unique to me since we don't have it in the States. It would be so easy (and refreshing!) to make - I think the sum total of the ingredients would be 7up with bitters on ice, or you could get all fancy and do a tonic with fresh squeezed lemon & lime & bitters. Regardless, delicious. update: Kangaroo. OK, look - I couldn't travel to Australia and NOT try kangaroo. I had it twice; once slow roasted in a brown gravy like venison, once smoked and sliced like a cold cut. I didn't particularly care for either. It's gamey, which I'm actually OK with, but it had a particularly strong aftertaste that I didn't care for. Looking at a kangaroo you can imagine that it's all dark meat. Turns out it is. Turns out I don't like it.